Ashwagandha (Withania somnifera), also known as Indian ginseng, is a plant in the Solanaceae or nightshade family. 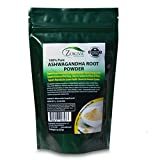 Ashwagandha has been used in Indian Ayurvedic medicine for centuries. Ashwagandha contains a class of compounds known as "withanolides", that are thought to have calming effects during periods of stress. It may also have antioxidant properties. Ashwagandha supplements come in bulk powder and capsules. "A few small clinical trials suggest that specific antioxidants from diet or vitamin supplements might improve asthma control or lung function in asthmatic children or adults." Some studies have found that oxygen free radicals have a causal role in auto-immune diseases, such as rheumatoid arthritis (RA). However, a report by the Harvard School of Public Health, found that "Randomized, placebo-controlled trials—which, when performed well, provide the strongest evidence—offer little support that taking vitamin C, vitamin E, beta-carotene, or other single antioxidants provides substantial protection against heart disease, cancer, or other chronic conditions. The results of the largest such trials have been mostly negative."